To retain moisture: as the temperature heats up in the coming months, moisture in the soil will evaporate. To keep that moisture close to the plant roots, we can add a layer of mulch that will reduce evaporation. There are lots of options available for choosing a mulch. As with a lot of tasks in the garden, I think it’s important to ask yourself what your goal or purpose is – why do you want to mulch your garden beds? Do you want to feed your yearly crop of organic vegetables? Do you want to spend less time on your knees pulling weeds? Or do you want to have a beautiful show of blooms on your flowering shrubs and perennials? When you know what you are trying to achieve, you can go about choosing a mulching material. For instance, if you are choosing a mulch for your small organic vegetable bed, your choice will be quite different than if mulching large garden beds in order to suppress weeds. Here in Vancouver, some of the organic materials that are easily available include composted bark mulch, mushroom compost, homemade garden compost, leaves, composted manure, arborist’s chips, newspaper, and worm compost. In the garden bed above, wood chips have been used as a mulch. In this bed, the main purpose of the mulch is probably weed suppression. It’s important to know that as wood chips break down they rob some soil nitrogen, and therefore compete with plants for nutrients. However, in this bed, low cost and weed suppression have most likely been the most important factors in choosing a mulch. In the bed on the left, leaves from the trees above have been left on the bed as a mulch. 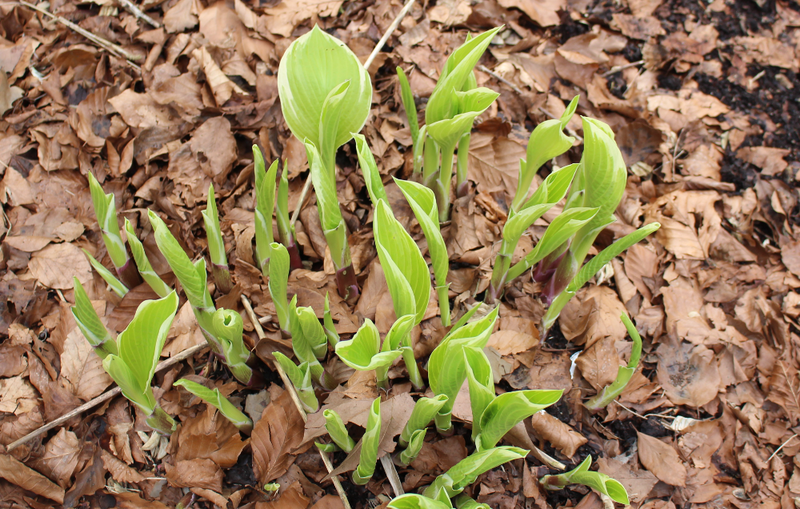 Fine textured leaves are fine to use as a mulch. 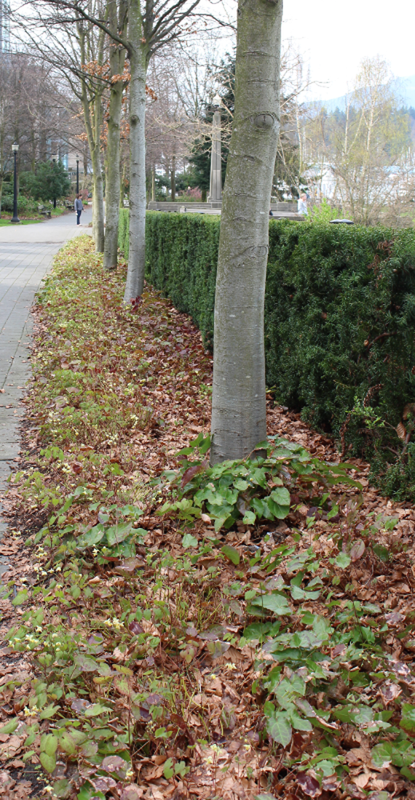 Larger leaves or leathery leaves should be shredded when dry before putting on beds. When used as a mulch leaves can return valuable nutrients to the soil. Contact us at Growing in the Garden if you would like us to apply your spring or fall mulch.